In an emergency situation, every second counts. 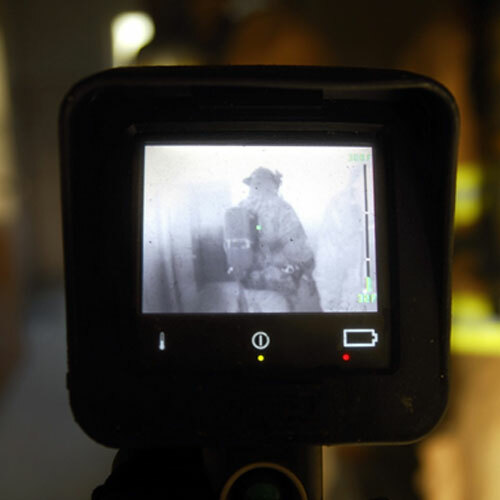 Increasingly, firefighters are using more high-tech equipment to save lives, including thermal imaging devices (also known as temperature reading cameras). While specialty cameras designed to detect and locate life forms in extreme conditions are being used more often in the fire rescue industry, electronics tend to have difficulty withstanding high temperatures. A manufacturer approached Polymer Technologies because their thermal image device was plagued with performance quality and lifespan issues caused by operating in extreme heat. The manufacturer’s thermal imaging device had a short lifespan in high temperatures because the insulation quality of the device lacked longevity and high heat tolerance, causing the image readout to be distorted. The unreliable readouts were a problem that prevented firefighters from accurately assessing rescue conditions. Our team of energy management experts was brought on board to develop a solution to extend the operating life of the thermal imaging device. After an initial analysis, we determined the expanded styrene foam insert being used for shock and thermal protection was not adequate for achieving the intended operational life. We realized a new custom designed insulation material was needed to meet the manufacturer’s extreme temperature conditions, and we knew that our Polymer Molded Products Division (PMP) was up to the challenge. Our experts determined that this application called for the design and development of a two-piece POLYFORM® molded urethane foam part. The two pieces of molded foam encapsulated the thermal imaging device, providing shock and thermal insulation protection that outperformed the manufacturer's initial solution. The molded foam pieces were specifically designed to conform to the contours of the device, creating a fit that snapped into place and eliminated the need for additional fasteners and assembly time. The superior thermal insulating capabilities of POLYFORM® molded urethane foam afforded the thermal imaging unit additional minutes of operational life in hot, harsh environments. This extension of time helped firefighters take more accurate readings to save lives in intense conditions. The resilient nature of the POLYFORM® molded urethane foam also significantly improved shock resistance. The added layer of protection provided extra shock absorption in the event the unit was dropped, jarred, or bumped during use. On top of these benefits, POLYFORM® molded urethane foam simplified the customer's production process and increased overall profit by reducing manufacturing costs and adding to device sales. Taking time to consider the possibilities of molded foam at the start of a project can help OEMs design products with noise, vibration, and temperature control in mind from the start. Protect equipment and products from extreme conditions while improving functionality, assembly time, and cost with a molded solution! If the possibilities of molded foam excite you, then be bold and develop your own custom mold with us, the experts at PTI.